The `dear' little Robin is one of our most loved birds but in reality they can be little monsters. Robins are very territorial and the male will only allow the female into his territory during the breeding season. Males can be very vicious and fights to the death between two are not uncommon. In my small garden Robins have nested amongst the pots in a cold frame, among the pots in my greenhouse, in ivy on the garage wall, and twice in an open fronted nest box. These are the ones I discovered because on other occasions the first sighting was young robins hopping around. The first two were well advanced before being discovered and at one stage I had young Robins clambering around the greenhouse benches. Unfortunately those in the nest box were predated, by what I don't know for certain but probably Magpies. I was prompted to do this by my friend Hap, because of an initiative by the artist Jean Haines. This is called `A Robin for Charity', the idea being that you sell the painting and give the proceeds to charity. As I'm not exhibiting at the present time I'm not sure how to do this. In case anyone thinks this is a cop out we do have two monthly standing orders to charities, one the RSPCC, and usually give to one of the Xmas appeals. This is a modest little painting done quite quickly. I first completed the drawing using a mechanical No5 2B lead. The eyes and beak and surrounding area were painted first with Ivory Black for the darks. The red breast is a combination of Transparent Orange (Schminke PO71), Cadmium Orange (Maimeri PO20) and Cadmium Red with a little Quinacridone Gold (Daniel Smith (PO49). Mostly mixed on the paper. The lighter areas are various combinations of Cerulean Blue, Cobalt Teal Blue (Daniel Smith PG50), Raw Umber, Raw Sienna and Quinacridone Gold. The ground the Robin is standing on is a mixture of Raw Umber, Raw Sienna and Burnt Umber. I sprayed this area with W & N granulation medium. Brushes were the Isabeys sizes 6,8 and the retractables. I think that's it. Looking at Gerard Hendriks way with birds and animals and his `painting a day' series, I was prompted to try something sort of similar myself. I've already had a shot at a few birds and expect to do more but in this instance came across a photograph that appealed so off I went. I aimed to produce a kind of snapshot. I first made the drawing using a mechanical pencil 05 with 3B lead. I concentrated purely on the head and cub and only extended the body so far - a sort of vignette. Colours were primarily Quinacridone Gold (Daniel Smith PO49), Quinacridone Rust (Graham PO48) and also some Quinacridone Burnt Orange (Daniel Smith PO48). Although this latter is the same pigment as the Graham Q Rust it is darker and redder. There is also Cobalt Teal Blue (Daniel Smith PG50) and Ivory Black (Mamerii PBk11), There are slight touches of Raw Sienna and either Raw or Burnt Umber. Possibly some Cadmium Orange (Maimeri). The background is Cerulean. I was rather pleased with the result but soon realised I had not quite got the head proportions right. The head is slightly too long in relation to the width. I did try and correct but it only worked so far. My wife spotted it straight away but I felt that some aspects of the painting worked well so what the heck! I used the Da Vinci Artissimo 44 Size 2 Kolinsky for most of the painting and a smaller Isabey 6228 for the detail bits like the eyes. Afterwards I added some white gouache in a few places. There was a good attendance with 19 members present and everyone was soon hard at work. In my case I selected three photographs of individual fish and first made a rough drawing on cartridge paper to see how they should be arranged. It should be emphasized that it was a case of getting on with it as we didn't know beforehand - which we usually do - what we were being asked to paint so had to jump straight into the water! This was my effort and you can see the three photographs on the left of the painting which is about two thirds of the way through. I should add this has all to be completed in a two hour period which includes a refreshment break, although this is taken individually, rather than as a group. After the initial rough drawing I began in earnest and made an accurate drawing of the three fish placing them in a roughly triangular arrangement. I then began painting starting with the red fish near the centre, then the one on the right and finally the one on the top left, simultaneously painting the background to try and avoid them looking pasted on. Three Friends 16" x 12" Waterford 140lb (300gsm) Not. The subject lent itself to a very colourist approach with the range of colours in the fish. I used quite a few colours, five blues, Cerulean, Cyan Blue (Maimeri PB15:3), Prussian (Graham PB27), Cobalt Teal Blue (DS PG50) plus a touch of Cobalt. Reds were Cadmium Red Pale, Quinacridone Rose (Graham PV19), Quinacridone Coral (DS PR209), Quinacridone Fuschia (Daniel Smith PR202) and Perylene Maroon (Graham PR179). I also used Moonglow (Daniel Smith PG18, PB29, PR177) for the fish on the right. I usually avoid three mix pigments but in this instance made an exception. Colours in the background were mainly Viridian, Prussian and Cyan Blue, Sap Green and Green-Gold. The brushes used were the DaVinci 44 Artissimo No2, Isabey 6228 No6 and a sable No4. I mostly used the Da Vinci Artissimo. This is a subject I've never done before and I enjoyed the challenge. Too many colours? The Comanches - Lords of the South Plains - were one of the most feared of all Indian tribes. In the late 18th Century it was estimated there were around 45,000, one of the most numerous tribes, but numbers declined so that by 1870 only 8000 were left. The low point came in 1920 with census figures of only 1500. Present day numbers are around 15000. Comanches were renowned as magnificent horsemen, more at home on a horse than on foot, and had a reputation - in addition to that of ferocity and cruelty - as excellent horse breeders. Before the coming of the whites they waged war against the Spanish and later the Mexicans and took many captives, some treated as slaves others eventually adopted into the tribe. At the high point they roamed an enormous area which covered present New Mexico, Southern Colorado, North-Eastern Arizona, Southern Kansas, Oklahoma and most of North-West Texas. Their home territory was known as Comancheria and they resisted white encroachment - often described as the Comanche barrier to settlement - for many years. The Comanches and Texans especially hated each other and dreadful hostilities continued between them until the final surrender of Quanah Parker in 1877. For a good history try Wikpedia. I have several books of which `Comanches' The Destruction of a People by T.R.Fehrenbach is excellent,and `The Comanches' Lords of the South Plains by Ernest Wallace and E.Adamson Hoebel another. 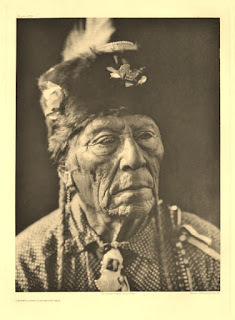 Quanah Parker, son of a Comanche chief and a white captive woman is one of the most famous individuals, see `Empire of the Summer Moon' by S.C.Gwynne. He later became a wealthy cattleman and celebrity. 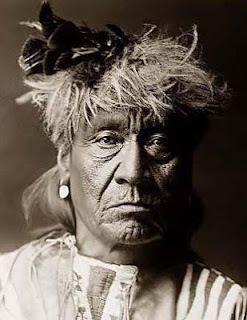 Edward Curtis the famous photographer and author of the monumental `The North American Indian', took most of his photographs beginning around 1895. By this time the Indian wars were over but memories were still raw. Much resentment remains to this day, especially on the present day reservations. This photograph may have been taken around 1900 or a little later. I know nothing of this individual other than he was a tribal elder. I first made a careful pencil drawing using a mechanical pencil 07 with a 3B lead. Beginning with the eyes I painted the features first. Skin colours were various mixes of Cadmium Red Pale (Rowney), Quinacridone Rust (Graham PO48), Raw Sienna, Cobalt Blue and a little Burnt Umber all (mainly) mixed on the paper.. The fur hat is mixtures of Quinacridone Gold (Daniel Smith PO49), Raw Umber and Raw Sienna. The shirt is Cerulean Blue and Gold Ochre (W & N PY43). I wonder of Hap will approve of the skin colour? On Thursday 8th November Paul Weaver the award winning Bristol artist gave a demonstration to Avon Valley Artists, 21 members present. Paul, who was very successful at the prestigious Bath Prize last year, has a growing reputation, which is beginning to extend beyond Bristol, Bath and the surrounding area. Paul paints in the traditional English style and specializes in landscapes and other outdoor scenes with buildings. On this occasion he was asked to do a demonstration painting of the Bristol dock area. Paul began as a landscape artist and studied initially - like so many others -with Ron Ranson. The artists mentioned he particularly admired were David Curtis, John Yardley and Ken Howard. I believe Trevor Chamberlain is another favourite. Paul trained as a graphic and design illustrator, and told me that drawing was not something stressed in this profession, although most graphic artists do draw well. He still does some graphic work, although now working as a full-time professional..
A selection of photographs on which the painting was to be based. Using a viewfinder to crop the photograph. As you can see he uses a home made viewfinder in two pieces, which allows greater flexibility in framing the subject. Paul normally uses a viewfinder when painting or sketching outdoors. Paul started off by making a value drawing on cartridge paper with charcoal. The value drawing. The advantage of using charcoal is that you can easily correct mistakes or make alterations. Paul began by taping the paper to the board with masking tape, a roughly half inch overlap. He then made a quite loose and faint drawing. Then using slightly darker pencil marks highlighted the key areas. Paul uses a 4B pencil which is quite soft. He holds the pencil some way from the tip. With such a soft pencil he is careful not to press too hard, and stressed the danger of the harder leads is that the pencil can mark the paper which can cause problems when you apply paint. He then commenced painting, using primarily neutral colours, Initially he put faint washes over the sky and other areas. He began with darker paint on the area furthest away, then towards the right hand closer buildings. Paul uses wet into wet a lot. Detail is painted with stronger colour when the paper is dry or just damp. He considers value more important than colour. He then painted the wall next to the boat and the dark reflections. We had a recess for tea/coffee and biscuits. The large boat was completed next and then the small one. Finally the reflections and the masts. He lifted out some paint using the dry tip of his brush. The whole painting, took about 11/2 hours, and he was explaining what he was doing pretty much continually - very clear and easy to understand. As there were 30 minutes remaining Paul did a very rapid second study based on a photograph of more boats. He cropped the photograph with his viewfinder and off he went. 16" x 12" Bocking ford. The demonstrations were made on Bockingford paper.He uses this for outdoors, where quick working is required, and for demonstrations. His main paper choices are Saunders Waterford which he considers has now been enhanced with the introduction of the `High White' version. He also likes Arches. While he uses Bockingford he said the main fault is that the paint dries faster than on cotton papers. Bockingford is made from high quality treated wood pulp whereas Waterford and Arches are cotton. Pauls palette comprises approximately 19 colours of Winsor & Newton paints, including a few Cotman colours. It is composed primarily of reds, blues and yellows with warm and cool versions of each. He uses a much smaller number in individual paintings. Colours in his palette include Raw and Burnt Umber, Raw Sienna, Permanent Magenta,Viridian, Blues Ultramarine, Cobalt and Cerulean, Permanent Rose (Cotman), Alazarin Crimson, Light Red, Cadmium Orange, Red, Lemon and Yellow, and Lemon Yellow. These demonstrations were interesting and informative, enjoyed by all present, regardless of individual styles or medium.. Paul is an excellent demonstrator and clearly explains what he is doing and why. He also told us that he has been making a DVD over the past year with the help of a friend and it was almost finished. His website is www.paulweaverart.co.uk/ Paul has recently had an article published in the `The Artist' and more will follow. Labels: Avon Valley Artists, Paul Weaver Demo, Waterford `high white'. Book Review - Transparent Watercolor by William Condit. I have something like 90 art books, primarily on watercolour. My friend John Softly has even more and suggested to me that amongst them this book by the late William Condit, who I'd never previously heard of, was worth considering. Enquiries at Amazon brought the information it was available at a very cheap price, just over £6, so I wasn't making a large commitment buying it. This book is not a `how to' watercolour book, although he does go on about `transparent watercolour' quite a lot and also discusses his materials, which he calls `his ammunition'. Condit relates how 32 publishers turned the book down before he eventually decided to self publish. It is essentially about him and his journey as an artist. He sold his own company in 1979, described as a `design and exhibit' firm, and launched on a career as a `transparent' watercolour artist. Note the transparent bit as he was totally against opaque pigments and thought they shouldn't be allowed into a `true' watercolour artists palette. He also talks about the history of pigments and here he thanks Winsor & Newton for their assistance. The most interesting part of the book - a significant part - details his experiences learning under several well-known artists, including amongst others, Tony Couch, Frank Webb, Claude Croney, Tony Van Hasselt and Charles Reid. All top artists. I was particularly interested in the Charles Reid part for obvious reasons. Following this he turned professional and was soon hosting his own workshops. He later opened a gallery, the Sand Dollar Gallery, now run by his daughter who is an abstract artist, and as noted self-published his book. The book is well illustrated with his and other artists paintings, primarily his workshop tutors. Rather chameleon-like he instantly seemed to take on the style of the artists he studied with and you can see remaining elements of them in his own paintings. Condit was a competent artist without being very exciting. His style is recognizably North American and as noted you can see traces of his tutors. Nothing against that, we are all influenced by others. Is it worth buying? Hard to say. Undoubtedly there is quite a lot to interest one in this book.At the price it isn't much of a decision and certainly it is different. Probably of most interest to American artists. Thanks to John for bringing him to my attention. Just received the Great Art magazine - actually a large pull out leaflet - with some incredible paper deals for watercolour artists. The Winsor and Newton artist quality paint offers, previously highlighted, are included and prices for Fabriano, Waterford and Arches are the best I have seen for a long time. There are great deals for other media artists. This is my latest attempt at an Amerindian based on old black and white photographs from Edward Curtis. I have adopted a different approach, specifically with regard to colour. The Atsina, otherwise known as Gros Ventres or less flattering as `Snakes', were a branch of the algonquin-speaking tribes located in North Central Montana. At the turn of the 19th century numbers were reduced to a few hundred but have since increased substantially. Wikpedia has comprehensive information. Interpretation of the photograph was again difficult. Is his hair grey or what? It certainly looks peculiar. I decided not to get into a tangle over this and went for an impression rather than a very realistic approach. Colours used for the face were Cadmium Red Pale, Yellow Ochre, Cerulean. and Ultramarine Violet (Rowney PV15) for the shaded areas. There are touches of Cerulean and Raw Sienna in the hair with Perylene Maroon (Graham PR179) for the red top piece. Raw Sienna and Perylene Maroon for the shirt. Some Cadmium Orange (Maimeri PO20) and Viridian (Rowney PG18) in the background. I tried to match complements, also alternating warm and cool..There are small amounts of white gouache in places. Brushes used were the Da Vinci Artissimo 44 Size 2 Kolinsky and Isabey 6228's, 4, 6 and 8. 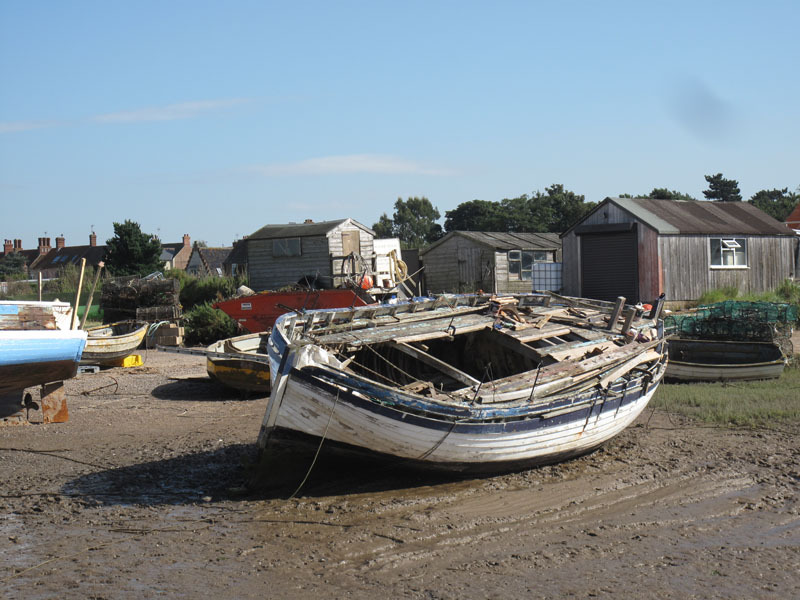 This month Mick Carney chose the subject, obviously a beach scene - I don't know where - with the boat in the foreground the centre of interest, and the buildings and other smaller boats as the supporting cast. How to handle it? As part of this process I printed a black and white version of the photo but it didn't help a lot. My initial approach was to make a loose but reasonably accurate drawing using my version (!) of Charles Reid's modified contour drawing. The reason I say `my version' is that I don't do it as well as he does. I prefer version 1 but with my `warts and all' policy I decided to show the second attempt where the main change is to make the boat much larger. That painting isn't sufficiently developed but I don't like going over the same areas time and time again. The main problem (to me) with this painting is that the original scene is on the dull side with the derelict boat framed by a motley collection of buildings and dull tree foliage in the background. However `jazzing' it up tends to make the whole thing look artificial. In both instances I painted the boat first then the sky and then the buildings followed by odds and ends like the boats on the left hand side. Initially I put masking fluid on various bits of the boat to save the small whites. This was removed after the boat was fully dry and I also used a little white gouache. Colours were various greys mixed from different solutions of Ultramarine Blue, Burnt Sienna and Burnt Umber. Raw Umber on some of the buildings. Some Cerulean Blue in there also. The boat was Cerulean, mixed greys and Raw Sienna. The large darks in the boat were Ultramarine and Burnt Sienna with Perylene Maroon dropped in to give them some variation. Brushes used were the Isabeys 6228's, mainly the number 8. After the initial drawing, which I was pleased with, I found the going hard and finished up somewhat unhappy with the result(s).